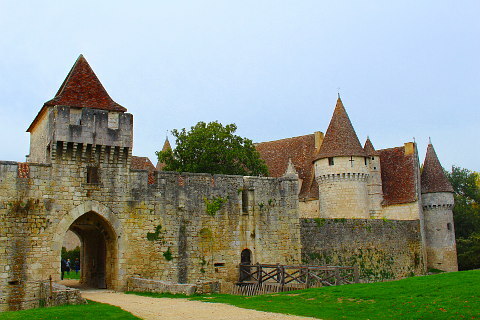 The more famous castles of the Dordogne department (Castelnaud, Beynac, Milandes) are an hour or so's drive from Bergerac. However there are some smaller castles and castle ruins closer to Bergerac that you might find interesting if visiting the town or area close to Bergerac that we show below. 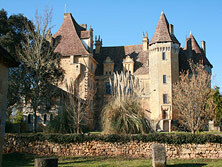 Most of these castles are found within about 10-20 kilometres of Bergerac city centre. Best known for the sweet white wine produced here, Monbazillac has far-reaching views across the surrounding Bergerac vineyards and countryside. Chateau de Bridoire has medievel rooms to visit and is excellent for visits with children as it has hundreds of games to play - both outdoors and indoors. 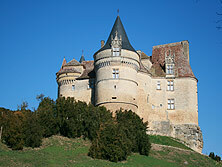 Dating from the 16th century Chateau Bannes is one of the most impressive castles in the region. Chateau Bannes though is not open to the public. 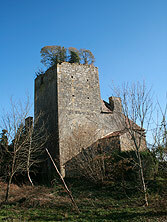 A solitary abandoned tower, worth visiting for the pretty traditional hamlet in which Banueil finds itself. 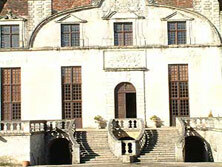 17th century chateau with earlier origins and section, Duras has some interesting features such as the interior courtyard to enjoy. 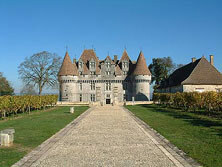 There are also various privately owned chateau near Bergerac that you can see if you are wine-tasting in the region, such as Tiregand castle to the east of the centre of Bergerac.